Happy Garden Blogger's Bloom Day and welcome to Garden Bloggers' Bloom Day for January 2015. Here in my USDA Hardiness Zone 6a garden in central Indiana, it's wintertime. This means it's cold, it gets dark too early and mornings are slow to arrive. We've had some colder than normal days, too, but not as cold as last January. Oh, and we haven't had as much snow, so far, as at this point last winter. But enough about the weather. I'm a gardener and so I've figured out how to have blooms in the wintertime, at least indoors. 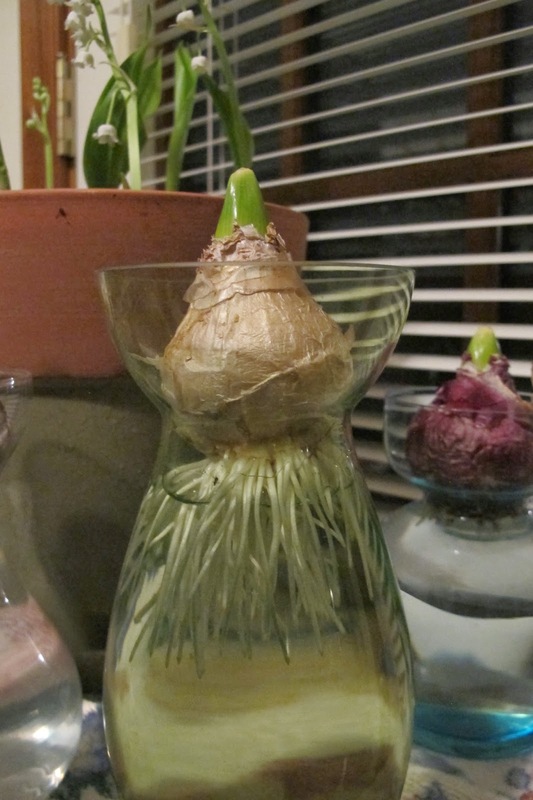 I always plant up a few amaryllis bulbs around Thanksgiving. The big white blooms pictured above are the end of the season of amaryllis blooms for me. These are just regular ol' big box amaryllis bulbs. They are fairly inexpensive so I don't know if I'll try to summer them over and get them to bloom next year, or treat them like annual flowers and compost them in the spring. One plant I've kept for years in the sunroom is my jewel orchid, Ludisia discolor. It blooms consistently every January. Sadly, though, as a plant it is just hanging on so there is just one bloom spike this year. I repotted it a while back, so hopefully, that will help it to hang on and maybe send up some new growth. A new bloom for me last year was Lily of the Valley, Convallaria majalis, and I couldn't resist buying more pre-chilled pips and growing it again this year. Oh yes, it is worth the price to smell the scent of Lily of the Valley in the wintertime. There are some other blooms in the sun room -- a little pink fibrous rooted begonia, a hot pink kalanchoe and crown of thorns in both pink and yellow. Those plants have a few blooms on them most of the time so they are "nothing to write home about". But I will soon be writing about the Hyacinths I'm forcing into bloom on vases. These hyacinths and a few other types of bulbs I'm forcing into bloom should be blooming by February bloom day, if not sooner. And who knows, depending on how this winter goes, I could have some outdoor blooms to write about then, too. What's blooming in your garden on this January bloom day? We'd love to have you join in for Garden Blogger's Bloom Day and show us what's blooming in your garden right now. It's easy to participate. Just post on your blog about what's blooming in your garden today and then leave a comment below and put a link to your post in the Mr. Linky Widget. If Mr. Linky doesn't cooperate for you, send me an email, and I'll help you out as soon as I can. Hello Carol, thanks for hosting the GBBD meme again, nice to see your indoor plants, especially your amaryllis. Mine are still having their winter sleep outside but will soon be coming inside so they can flower for Easter. Happy GBBD! Thanks for hosting Carol. So far this winter has not been as bad as last year but it has been very cold...at least not much snow here either. I enjoyed your indoor blooms. Happy Bloom Day! The white Amaryllis is just beautiful and that dainty little Orchid is lovely. My favourite though is definitely your Lily of the Valley. That's something that I couldn't grow here, so I can only enjoy it through photos such as yours. Thanks for hosting during the drearies of winter. Such beautiful indoor blooms--I especially like the Lily of the Valley and I bet it smells heavenly! Hope you are enjoying your indoor plants, they are sometimes one of the only things that get me through a dreary winter's day! It's summer here so I'm picking bouquets and photographing them for winter memories. Happy bloom day! I love the smell of lily of the valley - I must grow some soon. Apparently, Victorian head gardeners of large gardens used to grow enough lily of the valley flowers in hot houses to make up an entire sphere of blooms to perfume and decorate the 'big house' - it must have been divine. I had never thought of growing lily of the valley indoors - I have loads in the garden so I might see if I can pot some up. I enjoy your January Flowers and I am always pleased to see blooming orchid. I hope the orchid does well from its repotting, it's a beautiful thing. The lily of the valley must smell wonderful and at least in a pot they aren't going to invade! It's been a mild winter in England so far with quite a bit in bloom. It's making me think of Spring! Happy New Year Carol and all Blooms Day contributors! It's a shame we don't have smellovision so we can all share in the delicious scent from your Lily of the Valley. Thank you for hosting Blooms Day, Carol. I'm glad to be here to share you white winter wonders. I love the Amaryllis but you have inspired me to try potting up some lily of the valley. I've been digging out barrow loads. Thank you, Carol. It got down to -3 yesterday (not far from me it hit -14)so seeing all these flowers are so important. I didn't pot my Amaryllis in time. January, for me, is always a challenge but I found some blooms. Lily of the valley - hmmm (I can't stand the scent of paperwhites) I may want to look into that. Happy GBBD! Alana at RamblinwithAM. Lovely amaryllis! I don't know why but I seem to be a kiss of death to them. I never thought of Lily of the Valley indoors - you mention pre-chilled, so I presume that if you want them flowering now they have to be treated to flower early? I must investigate, since I've never seen them pre-chilled here. I love your amaryllis. I have been enjoying the fragrance from my hyacinths. I have one more that is not blooming. I am looking forward to it's fragrance. It's nice to have indoor blooms when your garden is covered with snow. I got some amaryllis this year too but but them in my greenhouse (heated to 50 degrees F) and they are emerging very slowly. Maybe I should bring them indoors? Your white one is glorious! Thanks for hosting and happy GBBD, Carol! I love the idea of forcing Lily of the Valley for winter scent in the house. I wonder if it would work if you dug them up from the garden and kept them warm. Thanks for hosting the meme. Beautiful amaryllis! I wish I had thought to bring mine in before Christmas; they're just now starting to grow. Thanks for hosting once again, Carol; I'm looking forward to seeing what is blooming for everyone. It is cold and gray even in Houston! I would love to have a sun room full of plants but just now it is my kitchen. I love the Lily of the Valley. I will have to try that! Happy New Year! HI there! I think I"ll force some bulbs, that's sounds like a great way to get through the worst part of winter! Happy GBBD! thanks for hosting! I love your idea of the lily of the valley blooming indoors! Can't wait to see how your hyacinths do. Oops! Almost forgot to come back to leave a comment. Bulbs indoors in winter are the best blossoms for cheer on a dreary day. My Hyacinths are about as far along as yours -- they'll be perfect Valentines. Although December here in Southern California was colder than usual, it's nothing like the winter you experience. We have quite a bit in bloom already but then our cool season (winter-spring) is often more productive than our warm/hot season. Sadly, though, I have no wonderful lilies of the valley to smell. Thanks for hosting Carol! Mr. Linky just doesn't work for me, but that's okay. Love those Lily of the Valley! Thanks for hosting. The Lily of the Valley is my favorite. Lovely amaryllis and lily of the valley, Carol - and good luck with your hyacinths. I have several in vases too and some may just about be ready to come out of the dark! Thanks for hosting. Today is my first official bloomday! It has been lost of fun looking through everyone's January blooms. I love your amaryllis! I've never gotten mine to look so good. And you've reminded me to get a start on my bulb forcing! I haven't even set up my paperwhites yet, terrible! Thank you so much for hosting such a great gardeners gathering! I hope I did the widget thing right! And I forgot to mention the amazing lily of the valley! I'm so very impressed. Lots of great indoor blooms there Carol...I am reminiscing again as mine are just starting to open. This time of year, flowers are mental health medicine and for me, fragrant flowers boost my spirits the most. I hope to try lily-of-the-valley indoors some day. Hi Carol, I wondered if you would have any more luck finding flowers outside than I did. It's pretty hard scrabble right now. But a few makes the hunt worthwhile. Happy Bloom day all! Thanks for another great Bloom day. Thanks for hosting once more. I think bulbs indoors are a super way of being surrounded by flowers during cold wet January. We do have some snowdrops and others flowering in the garden at the moment, but we are hoping that the frost doesn't spoil them. I'm interested to see the hyacinth blooms! What an interesting way to grow them. Carol, I'm envious of your lily-of-the-valley. Thanks, as always, for hosting GBBD! Late to the party as always... We don't have the winter you do at all - especially not this year. Never thought of growing Lily of the Valley indoors - what a brilliant idea! Their scent is so delicious, so indeed - why not? Happy belated GBBD! Lovely indoor blooms. Sadly, bringing plants through my front door signifies the signing of their death warrant! Just the reminder I needed to finally pot up the tulips chilling in the fridge since September! Tho snow is still on the ground, I could smell spring in the air today! I can only imagine the sweet scent of Lily of the Valley indoors. I'm going to try that next winter! How exciting to have your lily of the valley blooming now. It looks so pretty. I can imagine the smell. Forcing Lily of the Valley? What a great idea! You've probably never had a Bloom Day post or comment this late, but I'm trying to keep the record of my garden going. My favorite flower of the month is my 'Austin Griffiths' manzanita. Thank you for hosting, Carol, and I'll try to be more timely in February! Can't wait to see those hyacinths bloom! They really are the most beautiful flowers.